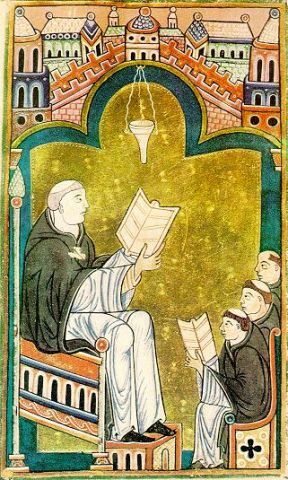 Hugh (1096-1141) taught theology at St. Victor, which was the abbey of the Augustinian Canons Regular in Paris. Hugh began teaching there in 1125, just a dozen years after its founding by a disciple of Anselm of Canterbury. Another motto of Hugh’s was “Learn Everything. Afterwards, you will see that nothing is superfluous (Didascalion 6:3).” So you can imagine what kind of school he ran, and what sort of tools he brought to the interpreter’s task. Hugh is an exemplary medieval Latin theologian in many ways. Here is an excerpt from his Didascalion, a kind of systematic account of education and interpretation. Hugh is explaining how deeper meanings are beneath the surface expressions of Scripture, and how the theologian should get to them. It’s quintessentially medieval because (1) It presupposes that Scripture is the source of ultimate truth, (2) it presupposes that the church has gotten the main things right and her teachers know how to teach it (“the rule of sound faith”), (3) It anatomizes an idea down to all its logical permutations, and (4) it’s two-thirds a direct quotation from Augustine.